IR’s Matt Zimmerman gets his Lake Forest opponent into a half nelson during this season’s Battle at the Beach on Thursday, Dec. 27. Jacob Grab wrestles for control against his Milford opponent. 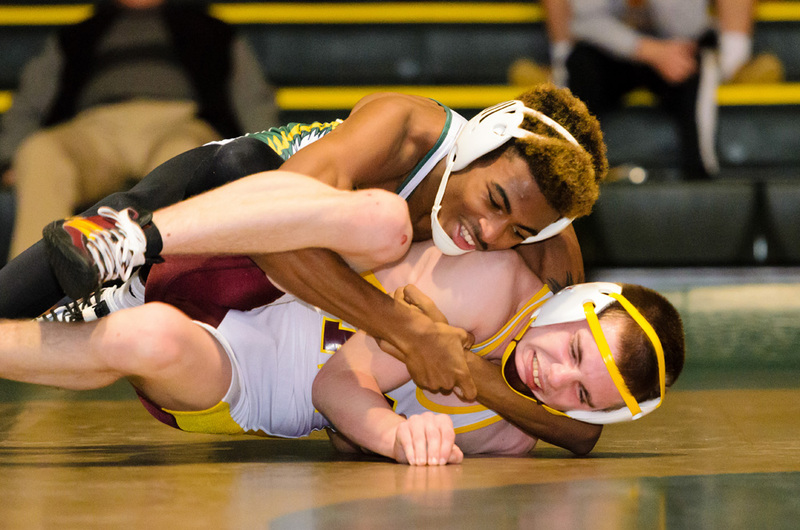 The 126-pounder won a gold medal for his efforts with a 3-2 decision against Middletown’s Sidney Ndi in the championship final. Knight was one of seven Indians to place in the tournament over the two days of action. West Chester Henderson was the overall team champion, with 206 points, while defending Delaware state champion Milford came in second, with 193. IR was seventh overall in the team standings, with 122.5 points. Knight was a perfect 4-0 over the two-day tourney, including a pair of pins in the first two rounds. He earned a spot in the final with his 9-4 decision over Moorestown’s Evan Glynos. 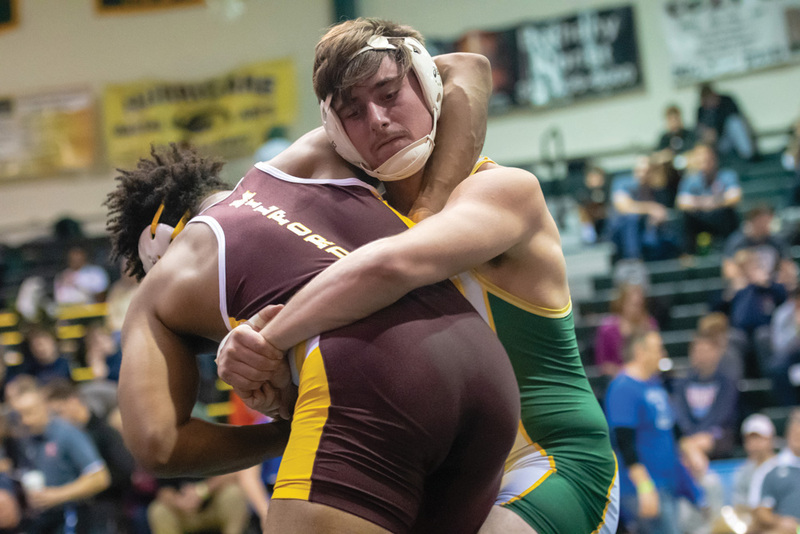 IR’s Will Rayne came up just short of a first place medal in the 120-pound weight class, falling in the finals to Henderson’s Killian Delaney, via fall at 2:23. Rayne pinned his way to the championship match three times, with all of those pins coming in less a minute, to finish 3-1 for the weekend. Ramond Turner was third at 285 for the Indians. He dropped a 5-4 decision in the semifinals to Oakland Mills’ Aaron Smith. Turner recovered to pick up the bronze medal with a pin at 1:49 over Delmar’s Chris Elliott. Turner concluded his weekend with a 4-1 mark. Chris Saylor was fourth for IR at 106, while Ian Shaubach (113) and Zach Schultz (195) each came away with fifth-place finishes. Dylan Ely was the last of the place winners for the Indians, coming in seventh at 132. The Indians will travel to the Delcastle Invitational this weekend, Jan. 4-5, for another run on the tournament circuit. 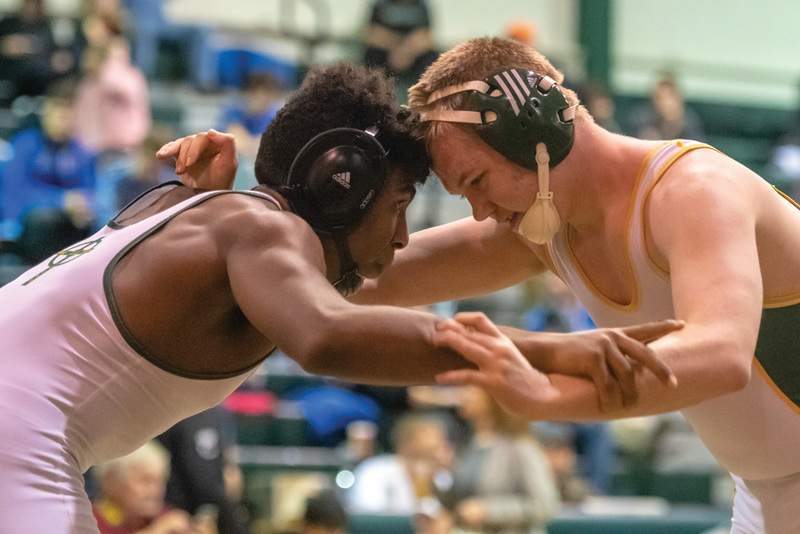 They will return to dual meet action with a Henlopen Conference South Division tilt on the road against Lake Forest on Wednesday, Jan. 9, at 6 p.m.